Create and design your own Victorian interior for the Garfield doll house by Dorien Litjes-Donkers. : Start building the Garfield Doll house. Start building the Garfield Doll house. We started building the Garfield doll house. It's taped so we can take it apart. The builders aren't allowed to enter the house with their boots on. Now we're going to label everything and strip the house all down. It's easier to decorate the walls when they're flat on the table. 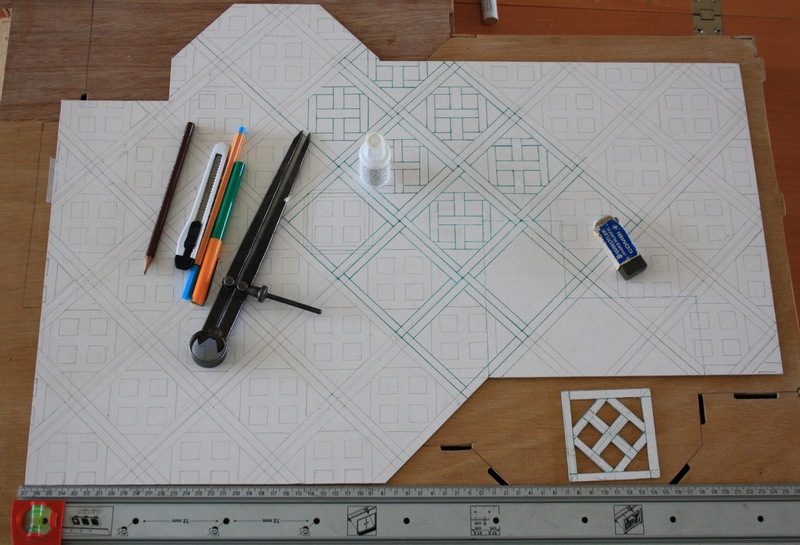 The pattern for the parquet floor in the living is almost ready. Then I can choose the veneer I want to use for the floor. Cut the veneer in small parts and glue it on the ivory board. When the floor is ready I can put it into the living room. It will take some time before that's ready.